We are back home safe and sound. I am somewhat caught up and for the most part rested from our mission to Nigeria. Wow, what an awesome time we had there and the friendships that were built will last a life time. We are excited at all God did and the open doors He produced with those we met. 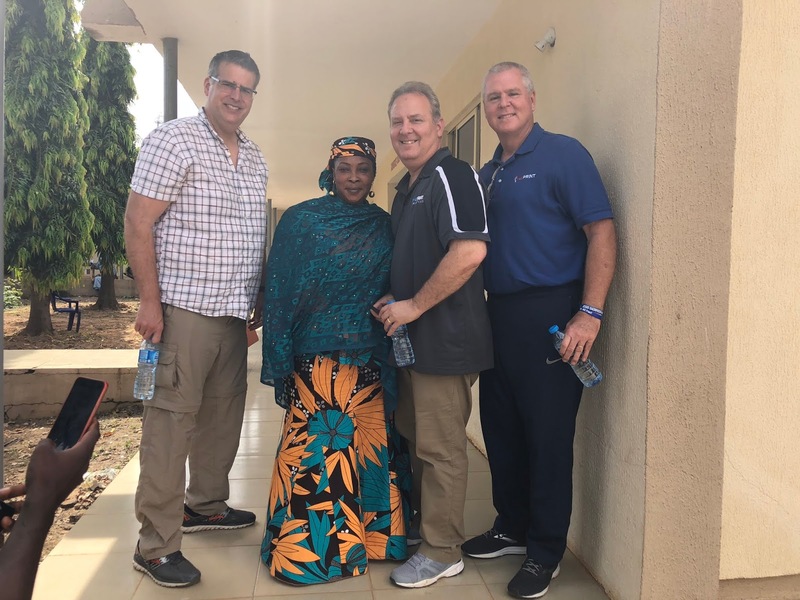 Brandon, Joe and me with Hajia Maryam Ishola. She is the Matron and President of the Parent/Players Association. We are looking forward to the future and the opportunities that we have in helping grow the game, develop relationships and share the love of Christ. In the coming year, we will be sending over more equipment to help Temitayo and his academy to further the game around the city of Ilorin and in the nearby communities. We are also extending an invitation to them to come and visit us here in Texas and develop a deeper relationship and establish ways to further help. Lastly, we are in the planning stages to return back to Nigeria next December to host Coaches Clinics and Player Camps in Ilorin. We are extremely excited and ready to do what God desires. Below you will see a thank you letter from the Director and Founder of Double T Baseball/Softball Academy that outlines their gratitude for what we did to help them with their dream. God bless and have a wonderful God filled day! You coming was a landmark event and History was made. The experience will last long in our memories and minds. The Children kept talking about your visit at the slightest opportunity. The Baseball and Softball Equipments donated to us is being put to good use and shared to schools understand our developmental programs and Little League Category. Thank you so very much for everything. It touches our heart for the love shown to us from 6,000 miles away. We are very proud of to associate with you. The appreciation letter has been printed and framed. The trophy won and the framed appreciation letter would be presented to the Distinguished Senator Dr. Rafiu Ibrahim by the kids/children of our Academy. We can never forget your meaningful and impactful contribution towards our developmental program and the development of Baseball and Softball in this part of the world. It means a lot to us. In Her Excellency’s goodwill message to me that I sent to you. H.E, Barrister Toyin Ojora Saraki was full of praise to you and HiSPrint, she acknowledged the fact that she was well honoured by the National Recognition and that she’s pleased with it. She even requested for the tournament to be yearly and a National event. We look forward to seeing you soon in Houston in April and further extend the frontiers of our bond and relationship in preparation for your coming back to Nigeria for camping and coaching clinics.